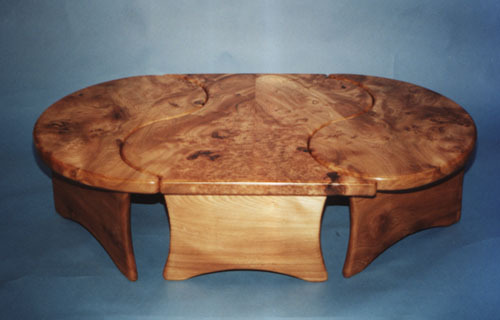 A variation of the Yin-Yang tables. By adding a third, middle section, I have extended the Yin-Yang tables into a long oval, suitable for standing in front of a couch. Each of the tables works as an individual piece and in combination with the others. The two end sections can be brought together in the original, circular Yin-Yang design.